xREZ Art + Science Lab students Max J. Parola and Samuel Johnson, together with professor Ruth West presented their research on presence in virtual environments at The Engineering Reality of Virtual Reality 2016 conference held in San Francisco Feb. 18, 2016. Their paper, “Turning Presence Inside-Out: MetaNarratives” traces operational definitions of presence from a variety of researchers. 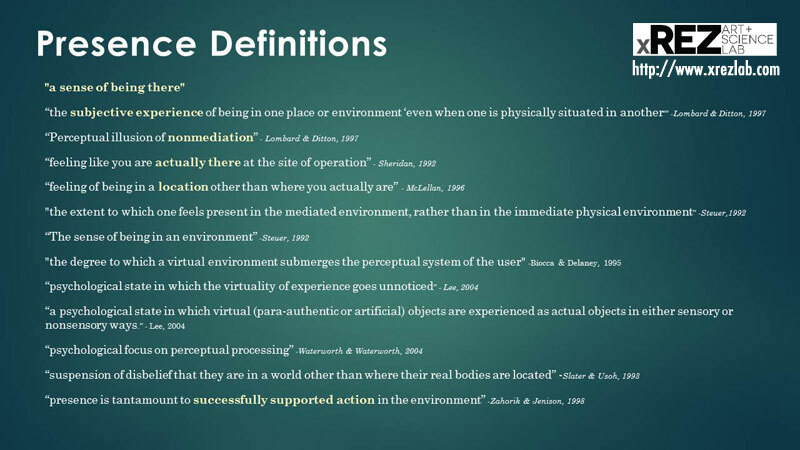 Presence in virtual environments has been called a “sense of being in an environment” , an “illusion of nonmediation” , a “psychological focus on perceptual processing” , and the “subjective verdicality of perceptual processing” . In turning the concept of presence inside-out, xREZ researchers placed different conceptualizations and theories of presence in context with each other. 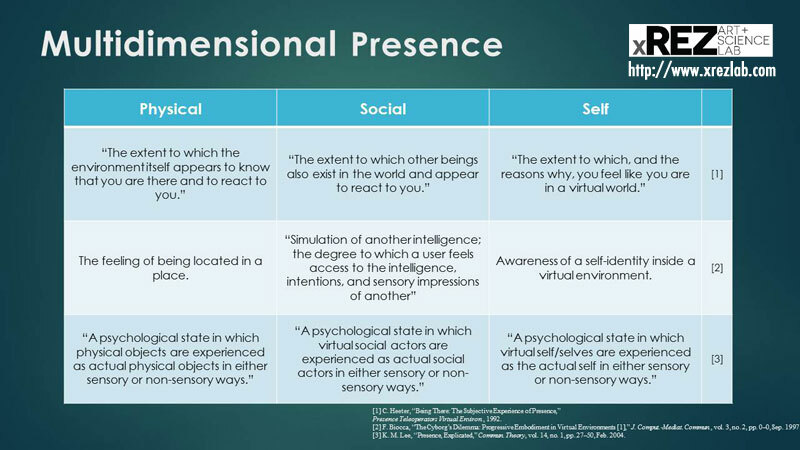 Their research reinterprets theories of presence in order to provide an account for presence which is supported by a broader range of theoretical views. As a result, they proposed that the definition of presence can expand from “a sense of being there” to a broader interpretation as “a sense of feeling real” . According to their paper, understanding the nature of the physical reality we live in and the associated cognitive and perceptual processes that underlie our experience with reality, as well as understanding how those processes may interact, change, or augment in virtual reality, can help develop enhanced experimental designs for “understanding the functional components of presence”. 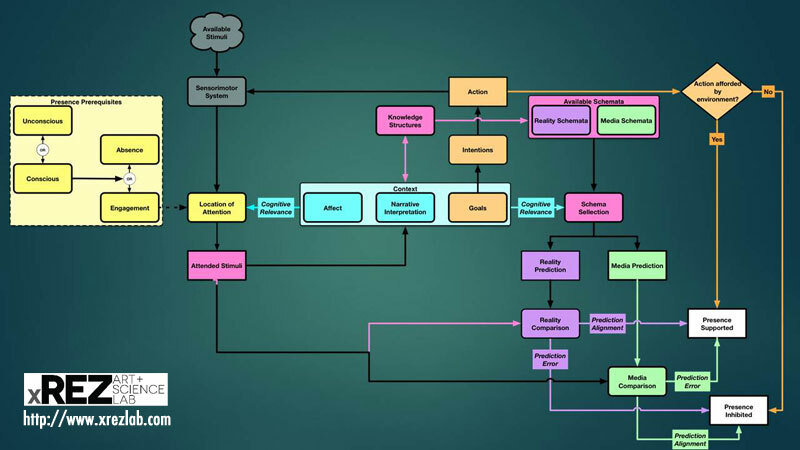 In reviewing the literature, the authors observed that “Neither the broad set of theoretical nor conceptual frameworks take into account the role of past experience and acquired knowledge of technologies or content, the domain of the content perceived and its role in predictive processes, nor the effect of context, despite the known effects of each of these on felt presence” . The paper also addresses the role of the individual’s experience in virtual environments by looking at “the mediating factor of personality variables”, “knowledge of or prior experience with the medium”, and considering the user’s “locus of attention”  while experiencing VR. Written by psychology senior Max Parola and computer science doctoral student Sam Johnson together with lab director Ruth West, the study asks whether presence is “a mediated phenomena or a structure of consciousness?” and presents layered frameworks of presence from a predictive processing viewpoint. M. Lombard and T. Ditton, “At the Heart of It All: The Concept of Presence,” J. Comput.-Mediat. Commun., vol. 3, no. 2, pp. 0–0, 1997. A. K. Seth, K. Suzuki, and H. D. Critchley, “An Interoceptive Predictive Coding Model of Conscious Presence,” Front. Psychol., vol. 2, 2012. Read more at the SPIE Digital Library, or read the full entry, downloadable below.